Collaborative-business strategies - the sharing of business information and ideas among partners, suppliers and customers can help increase sales, improve service, and decrease costs. But it can also be rather difficult. It's a strategy that besides trust and business culture requires the well considered technology infrastructure. But for those willing to tackle these and other challenges, collaborative business can pave the way to new and better ways of operating. The huge collection of shapes helps you to produces professional quality charts and diagrams so you are better prepared for productive team collaborating. ConceptDraw DIAGRAM allows you to import and export files in a large number of raster, vector, multimedia and text formats, making it easy to exchange data with other applications. In addition to the most popular graphic formats, it supports txt and ConceptDraw xml formats. Using export to PDF you create compact and platform-independent documents that can be freely viewed on any computer Export to MS PowerPoint lets you easily create animated presentations for the colleagues based on your ConceptDraw documents. Compatibility with MS Visio allows ConceptDraw users to exchange documents with MS Visio users by import of MS Visio to ConceptDraw and export of ConceptDraw files to MS Visio. With Presentation Mode you can perform an attractive full screen presentation from ConceptDraw documents without a need to use any special application. ConceptDraw DIAGRAM is the only professional diagramming software that works on both Windows and Macintosh platforms. All its documents and libraries are 100% compatible and can be exchanged hassle-free between the platforms. The role of ConceptDraw MINDMAP v10 is to organize and plan idea development and communicate between process participants. Mind maps are convenient to prepare presentations for team and management and send task lists and related information. If you are just a beginner in drawing flowcharts, it may seem that a sheet of paper and a pen are just enough. However, at the time you would want to share your results, diagramming applications would suite you better. it’s very easy to create diagrams that way and to discover new kinds of flowcharts. The huge collection of sample ConceptDraw diagrams, charts, illustrations and other types of business drawings includes a wide range of business themes. 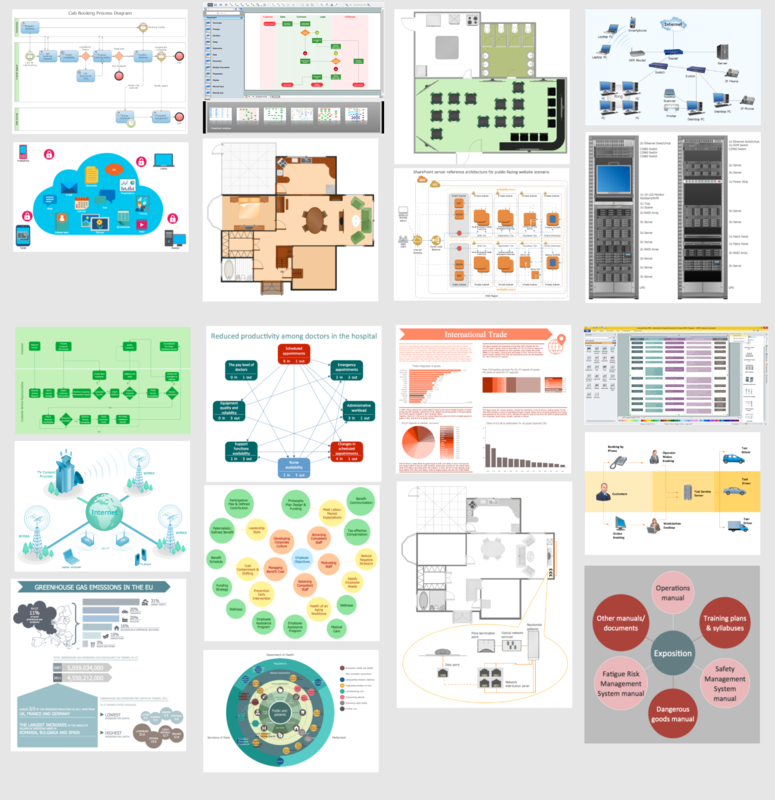 A huge number of graphic images of ConceptDraw documents is divides on business application areas according to business-oriented solutions for which they were made.Here is a short visual list of samples of flowcharts, process diagrams, UML models, management charts, computer network diagrams, maps, infographics, illustrations, etc. In short, each ConceptDraw solution is accompanied with at least ten samples representing some particular examples of the application of the given chart.